Shivlaxmi Enterprises started in 1991 with plumbing hardware material and gradually started growing into entire plumbing and water proofing solutions. Today it gets involved right from core strength of the building, the underground RCC pipes and DWC pipes to the internal strength like IRON - PVC pipes & fittings and water proofing chemicals. It also takes care of water diversion and storage by offering uncompromised quality of brass valves and water tanks taking into consideration green building idea and utmost hygienic antibacterial tanks. Always having acceptance to the gen-next technology in plumbing industry, we have started promoting the german technology pluming pipes known as Pex piping which is completely hassle free and absolute time saver. To save time and give exceptional service to our clients we support them with all the necessary plumbing hardware required for the perfect installing of our core products mentioned from the next page onwards. Shivlaxmi Ceramic is a sister company of Shivlaxmi Enterprises started in 2009, is a complete Bath solution & a wall & floor Tile dealer.After getting involved in the core strength of the construction by supplying entire plumbing and waterproofing solution, now it gets involved in the sanitation and design part of the construction. Today we deal into world class brands of Bath fittings and Sanitaryware, Wall & Floor tiles for all kinds of taste along with required chemicals & adhesives, Kitchen sinks, Super hygienic wellness products, Concealed flushing system and Bath accessories. Recently we have ventured into a new segment which brightens up the constructed structure that is lighting products. Right from the concealed lighting to industrial, Street-outdoor, and home designer lighting system. Current we are focusing on just one brand i.e Jaquar Lighting for project orders only. RCC PIPE & COVER, SEPTIC TANK. We at Shivlaxmi work as a one single unit and have completely abondoned ranks to avoid disparity. 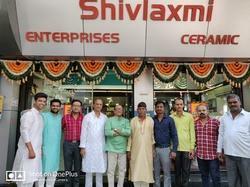 We believe each one of our members contributes equally to the growth of the organization therefor eveyone is an employee at Shivlaxmi and none of the member is single handed owner.